Discover the treasures of North America’s world-renowned shoe museum. 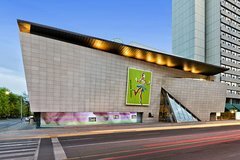 Located in Toronto, Canada, the Bata Shoe Museum has over a thousand shoes and related artefacts (from a collection numbering over 13,000) in architect Raymond Moriyama’s award-winning five-floor structure. The BSM celebrates the style and function of footwear in four impressive galleries. Footwear on display ranges from Chinese bound foot shoes and ancient Egyptian sandals to chestnut-crushing clogs and glamorous platforms. Over 4,500 years of history and a collection of 20th-century celebrity shoes are reflected in the semi-permanent exhibition, All About Shoes. Three other galleries feature changing exhibitions, so there’s always something new to see. In addition to our popular semi-permanent exhibition, All About Shoes, the Museum has three galleries for changing exhibitions, ensuring that each visit to the museum offers a new experience. Exhibitions generally run for a year, with 1-2 new exhibitions opening each year. Through the creation of innovative exhibitions the Museum strives to enlighten and entertain visitors of all ages. Manolo Blahnik: The Art of Shoes is an intimate retrospective spanning 45 years of work by one of the most influential figures in his field; his inventiveness and superb craft has managed to cross boundaries between fashion and art. The BSM is excited to be the final, and only, North American stop on this exhibitions worldwide tour.